for Soil Testing - Used to determine the moisture content at which clay soils pass from a plastic to a liquid state. Two Version are available. One the standard one & the other is semi-automatic with timer where the cone is allowed to free fall for a period of 5 seconds including one each of 50 gm. & 100 gm. 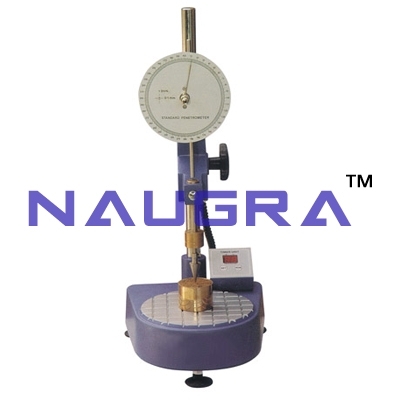 weight, one penetration cone, preset counter & measuring cup..
We are leading manufacturers, suppliers & exporters of Semi Automatic Cone Penetrometer For Testing Lab for Soil Testing Lab. Contact us to get high quality designed Semi Automatic Cone Penetrometer For Testing Lab for Soil Testing Lab for schools, colleges, universities, research labs, laboratories and various industries. We accept bulk orders for government tenders in all countries around the globe.